A predictable outcome for Friday's NASCAR Sprint Cup qualifying at Kentucky Speedway resulted in the #18 M&M Toyota of Kyle Busch starting on the pole for the inaugural race on the 1.5 mile speedway. However, the predictability was not because the Joe Gibbs Racing driver (who came from back in the field to win Thursday's Camping World Truck Series race) fast outings on track throughout the weekend. Rather, the forecast fall of rain showers washed out the qualifying session for Saturday night's Quaker State 400. 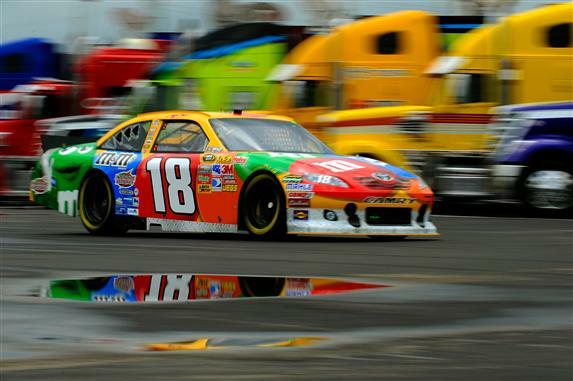 Under NASCAR's new-for-2011 using practice times instead of car owner points as the primary way to set race fields, Kyle Busch's 182.803 mile per hour time in the final practice session clinched the top spot when rain washed out the Kentucky Speedway. By virtue of their fast practice times, Juan Pablo Montoya, Kurt Busch, Kasey Kahne and Jimmie Johnson fills out the top-5 starting positions for the first Kentucky Speedway event with NASCAR Sprint Cup series. As 48 cars would have vyed for the 43 starting spots through the time trial session, some cars were favoured entry into the Quaker State 400 as a result of qualifying attempts made by a car throughout the 2011 season. Solidifying Joe Nemechek's #87 Toyota, the #60 Toyota driven by Mike Skinner and Travis Kvapil's #38 Ford in the race field at Kentucky Speedway, the rain robbed an opportunity for other drivers. The most significant driver missing out on the Quaker State 400 is Michael Waltrip. The home state for theWaltrip brothers Michael as well as his three-time Cup champion driver Darrell, the first Kentucky Speedway Sprint Cup event will not have the famous racing family represented in the 43-car field. NASCAR Sprint Cup regular Robby Gordon has also missed the chance to compete with his #77 car at the Quaker State 400 due to the wet track. Though Robby Gordon did not make it into the race, the #7 Dodge owned by the driver will start the NASCAR Sprint Cup Kentucky event in the hands of Scott Wimmer. TJ Bell, David Stremme and David Starr have into been forced to call their weekend's short without attempting a qualifying run.